Rocketing rents and the crash in the pound since Brexit has seen rents on London’s Bond Street rise to become the highest in Europe and the third highest in the world. According to research from global real estate giant Cushman & Wakefield, at the end of 2017 New Bond Street jumped to become the most expensive location in Europe in dollar per square metre calculations as rents increased by over a third (in local currency) on the previous year. Bond Street, which is home to world renowned luxury jewellery houses such as Cartier, Tiffany & Co, Chanel, Graff, De Beers and Harry Winston, is four times more expensive than Rue du Rhone in Geneva, the epicentre of luxury jewellery shopping in Switzerland. The increase, which is relative to other global destinations, underlines the strength of London’s premium retail offer and ability to attract influential shoppers from around the world. 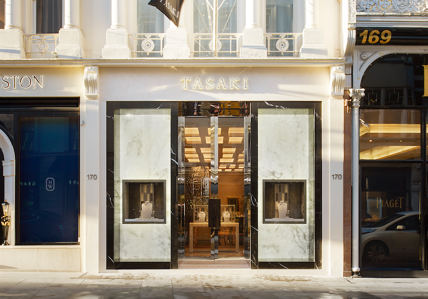 As such, despite the steep rent increases, London’s Bond Street is still highly sought after by international brands, and a visit to the prestigious shopping street reveals its business as usual for jewellers as they invest in boutique expansions and refurbishments to provide the most premium and up-to-date retail experience. Since its foundations in 1700, London Mayfair’s Bond Street has been a playground for society’s most wealthy and influential people, and today its reputation remains the same. Located in the West End, the road consists of two sections — Old Bond Street, which covers the southern section, and New Bond Street, which is the name given to the longer northern section. Despite being split into two many simply refer to the whole road as ‘Bond Street’. 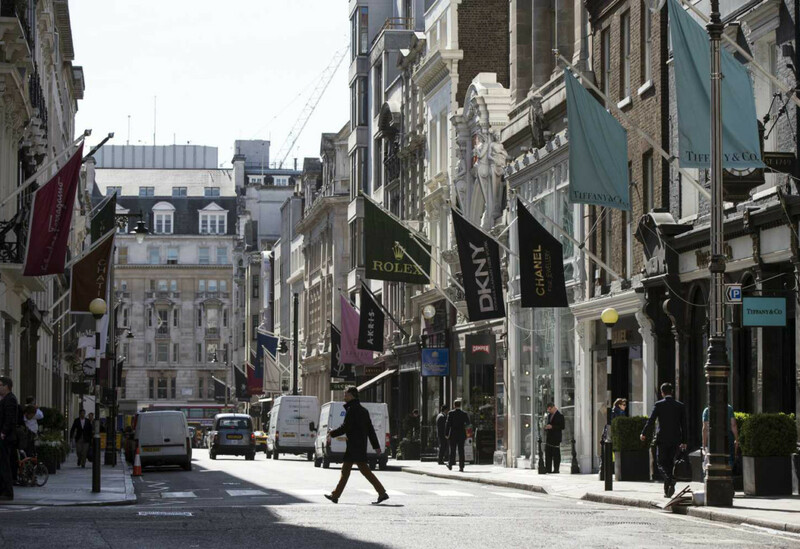 Since the 18th century Bond Street has been a popular shopping area for domestic and international visitors alike. Today, Bond Street is one of the most expensive and sought after strips of real estate in Europe and has more royal warrant holders than anywhere else in England’s capital. “On Bond Street we are in good company, as we are surrounded by some of the world’s most prestigious jewellers,” shares Mappin & Webb’s Old Bond Street store manager, Elizabeth Carville. Last year work begun on a £10 million scheme to radically transform the streetscape. The project has been described by developers as the most ambitious scheme in the Bond Street area in over 30 years, and is due for completion at the end of this year. Changes include a new pedestrian area between Bruton Street and Grafton Street where the ‘Churchill sand Roosvelt Allies Sculpture’ is situated. This widens the footpaths and makes it easier for consumers to leisurely shop. In addition, the sculpture itself will be renovated, and a new paving layout is hoped to create a more intimate and pedestrian friendly space. Between investment in the street and individual jewellers, if times are difficult for retailer’s in Bond Street, they are not letting it slow them down. Boodles waves the British flag in Bond Street. There is something amazing about walking down Bond Street and seeing the very jewels you play with at Baselworld shining through the store windows. Almost everyone has heard of Bond Street – from your out-of-touch uncle, to your ‘uninterested in jewellery’ boyfriend. It’s iconic and it alludes a sense of luxury and glamour many can only dream of. But is it profitable? 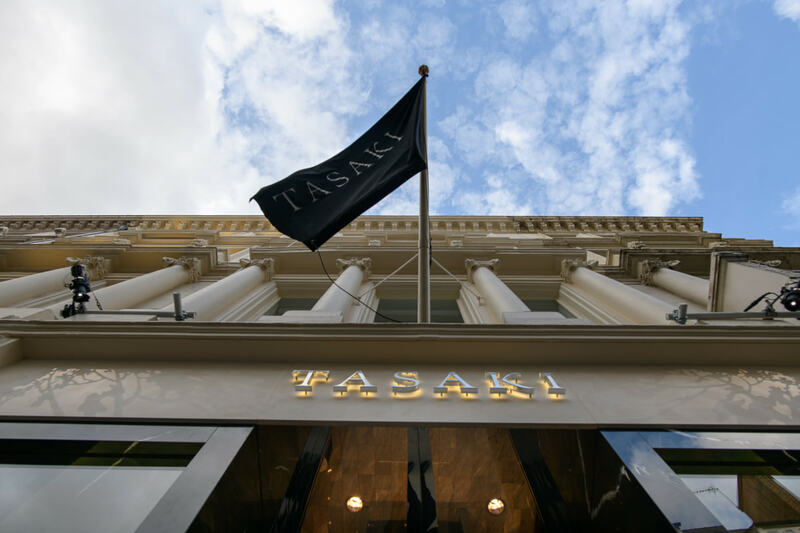 Challenges on Bond Street do not differ much from the obstacles jewellers face on ever other high street — rents are rocketing and footfall is decreasing. While some argue that shoppers spending money on Bond Street are less likely to be affected by Brexit, it doesn’t stop consumer confidence falling. “The obvious economic and political uncertainty in the UK does no favours for consumer confidence, although we have been surprised at the relative buoyancy of the market,” shares Boodles director, James Amos. While footfall has dipped, post-Brexit Britain has opened the door to an abundance of international opportunities, particularly for luxury retailers, and jewellers stocking the most sought-after watch brands. Aside from national challenges, Bond Street as a retail location is in a very strong position. 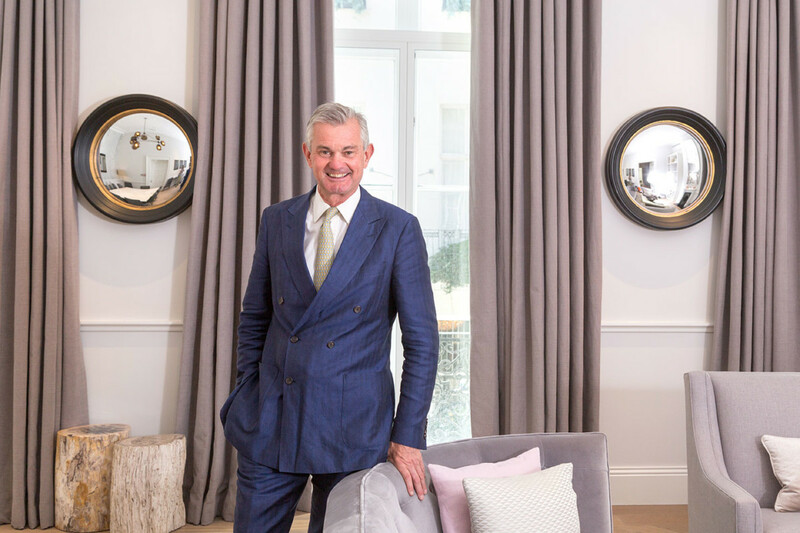 Jewellers Professional Jeweller spoke to were proud of the developments taking place, and were confident in Bond Street’s future as more jewellery and fashion houses take residence on the old or new side. 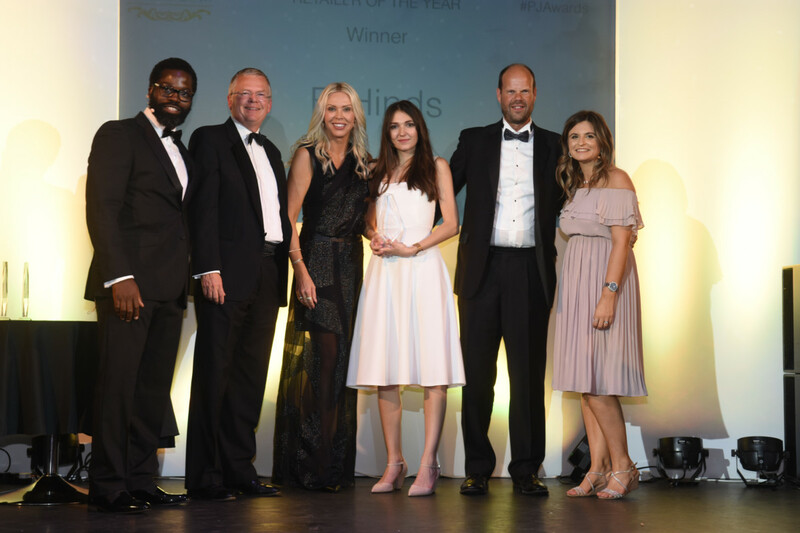 Business for David Morris has been growing over the last 12 months, with the jeweller opening new stores in Paris, Doha, and most recently Jeddah. This has helped build footfall internationally, and shaped the brand as a worldwide name. Holbech shares: “It is crucial for us to adapt to the changes taking place in the ever-evolving landscape of luxury retail as we believe that brands which continue to pursue outdated tactics to support their business run the risk of becoming irrelevant. As a highly-exclusive brand, a particular focus for us at the moment is to become more inclusive. Most luxury consumers today are digital natives with Generation Y paving the way; as a result, we are fully embracing the tech age we live in and are implementing changes to our interaction with consumers by digitally redefining what luxury means to us as a brand. At Boodles, its flagship store on Bond Street has been performing well, although the jeweller admits watches have played a more prominent part than usual thanks to favourable exchange rates. Despite popular belief, millennials do shop on Bond Street, with many jewellers noticing an increase in young engagement ring buyers, and the millennial middle class popping into store. “In Bond Street we see a cross section of customers from young engagement ring buyers all the way through to entrepreneurs and chief executives of listed companies who are looking for something special and different,” shares Amos of Boodles. Bestsellers in Bond Street at the moment include unusual gemstones, large white diamonds of different shapes and sizes, and unusual pieces which are exclusive to a brand/store. In a street almost solely dedicated to jewellery, it can be hard for jewellers to stand out. At first glance it can appear like the same set up at every store – diamonds sparkling in the window and a security guard at the door – but a dedicated visit to the street shows this is not true. Each and every company has a unique selling point — from the strength of the brand’s name pulling in punters, to the level of service once inside. On the third floor of Chanel for instance is a room for private appointments which resembles a luxury stately home. If you hadn’t walked through the store to get to the third floor, you would be forgiven for thinking you were at someone’s house. 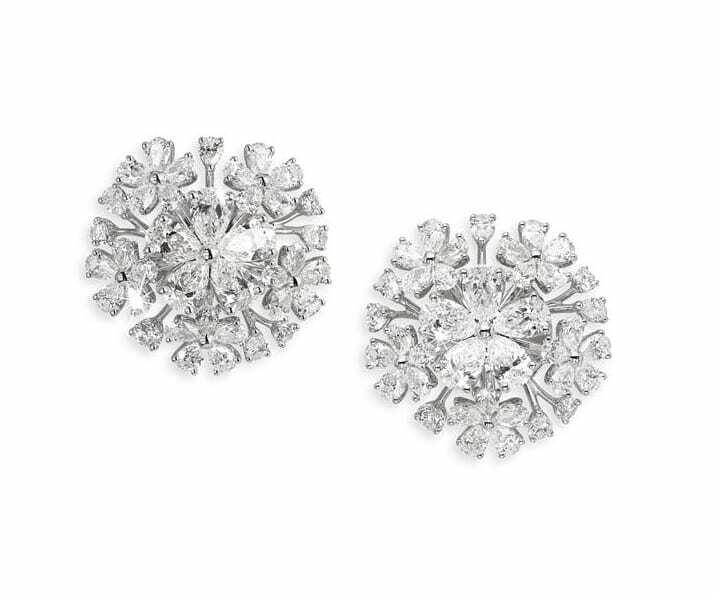 Over at Harry Winston the whole store was renovated in 2016 to offer the “elegance and intimacy” of a private estate — with each floor dedicated to a specific product offering. Although not one of the most well-known jewellers in the street, family-run Lucie Campbell stands out for its unique story – whereby the founder used to buy antique jewellery from auction houses and sell to a lot of the big names on Bond Street – and personal customer service. The likes of Boodles, Mappin & Webb, David Morris, and Graff Diamonds fly the flag for Great British craftsmanship, and each store has carved its own niche over the years. For David Morris the word ‘rarity’ sums up its USP, with the jewellery retailer being known for creating pieces with a wide variety of gemstones — some of which are rare, unusual and unique. On the other side of New Bond Street Frost of London prides itself on offering fantastic service, with thanks being attributed to its team. Over the next 12 months David Morris will continue to evolve its brand and develop its ‘Collections’ jewellery offering. “The Collections enable us to bring our brand and creative flair to consumers in a different way,” shares Holbech. “These are our entry level price point pieces. Elsewhere Boodles is looking to increase its customer event activities. With more businesses looking to open on Bond Street, and other jewellers investing money on store refurbishments, there is no doubt the playground for the wealthy will continue to sparkle for years to come. The challenge will be continuing to attract the next generation of luxury consumers, and building events to suit new tastes and ways of shopping.